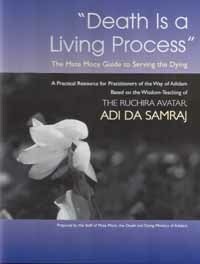 A practical resource for practitioners of Adidam. Based on the Wisdom-Teaching of the Divine World-Teacher, Ruchira Avatar Adi Da Samraj. ---Also constitutes Adidam University's self-study Topical Course on Death & Dying. To find out more, click here. Part One discusses what to do when a devotee of Adi Da Samraj learns that he or she has a terminal illness-the orientation of retreat and intensifying the release of body-mind identification, and the practical, legal, and other preparations to account for. Part Two focuses on the actual death transition-both the intensive period (of whatever length) leading up to death and the minutes and hours immediately following "clinical death". Part Three covers the three-day vigil of service to the deceased that Avatar Adi Da has recommended for all His devotees, and includes an address to grieving. Part Four describes special considerations relative to serving the death transition of someone who is not a devotee of Avatar Adi Da, including respecting his or her beliefs and maximally serving the process of release. Part Five focuses on concerns specific to the death of a child or a child's loved one. Part Six gives a summary about serving the death of animals. The guide also includes a number of practical appendices that provide supplementary instruction and forms otherwise mentioned in this guide. Death is all over the daily news. Through television, magazines, and now the internet, we are constantly confronted with a growing display of horrible and sudden endings due to accidents, war, and natural disasters. However, in our otherwise death-denying consumer society, we rarely see, face-to-face, the people who are dying each day-even those who die of old age and terminal disease. They die in hospitals, secluded and antiseptic, or their bodies are whisked off to the morgue or the funeral home. Perhaps, if a body is to be viewed, it is embalmed and made to look as if only asleep—a vision referred to as the "memory image" in the funeral industry. Family and friends generally have permission to participate more in their own feelings of loss than in the process the dying person is experiencing in and after death. Avatar Adi Da Samraj has shown us that actively serving those who are dying is a tremendous honor and responsibility. It is not only a service to the dying person-for the process of release, and for the sake of a most auspicious transition into the next moment of experience—but it is a service to ourselves, in that it counters the grief of apparent loss with the continued obligation to maintain relationship to one who has died. The process can also strengthen our seriousness about the nature of this world, and our response to Avatar Adi Da's Call to real Spiritual practice. This guide is offered by the Mate Mace Ministry of Adidam (see section on following page) as a practical companion-volume to Avatar Adi Da's "Source-Text" Easy Death. In Easy Death, Avatar Adi Da touches on every aspect of His Divine Wisdom relative to the death process-based in His unique experience and Spiritual Revelation. This guide focuses on the more practical questions that might arise in putting Avatar Adi Da's Wisdom into practice in life-and-death circumstances.